There's a great game fighting through the hordes of zombies to get free. Yesterday, I reviewed Gigantic, a game where the core is quite strong, but there's not much else around it. Today, I'm taking a look at Fortnite, a title that also has a strong gameplay loop, but one that's buried under a host of other ideas. Fortnite is the latest free-to-play game from Epic Games, following the successful launch of its action-MOBA, Paragon. I really like Fortnite. I find myself using free moments to queue up the game and do a mission. I've always been a big fan of building games like Minecraft, Starbound, and Terraria; Fortnite marries that general concept with a Horde mode, pitting you and several other players against incoming zombie-like Husks. 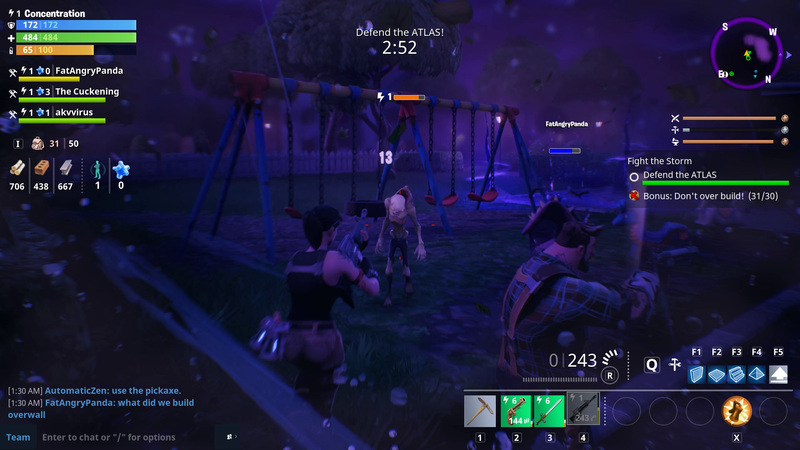 Every mission has you doing some general exploration; tearing down trees, rocks, and cars with your pickaxe; saving survivors; and preparing for the incoming Husk storm. The exploration is light and fun, dismantling everything in your path for materials, or finding hidden ore and treasure chests. At its best, fighting the hordes of zombies is great too. You can switch between using your weapons (pistols, rifles, shotguns, swords, axes, and more) and building your defensive structure at any time. 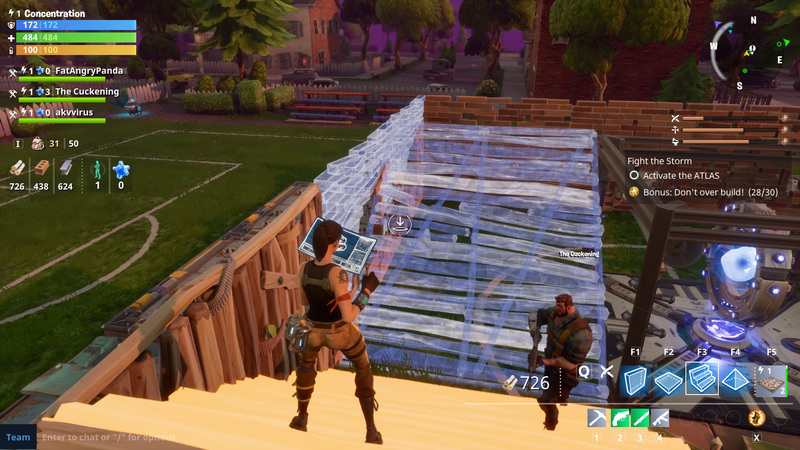 Building lets you place walls, floor, stairs, and traps on the fly. There's a bit of a learning curve to building, but the system that Epic Games has worked out here is rather elegant. Folks really liked Fallout 4 for its building system, but I found it ugly and ungainly. In contrast, Fortnite's system is easy to use and surprisingly flexible. Most of the time, you won't be building anything complex, but if you want to the option is there. It can get really tense and later on, you'll feel accomplished when you finish a mission with all the bonus objectives checked off. It's less about survival, like Rust and DayZ, and more about buildin' and shootin'. It's a freeform Tower Defense game where you build the towers in real-time. In-between most missions, you'll come back to your home base and build it up a little more, making it a cool visual indicator of your overall progress in the game. Epic Games correctly looked at the basic gameplay structure of Fortnite and realized, "We need more." So they added more. And more. 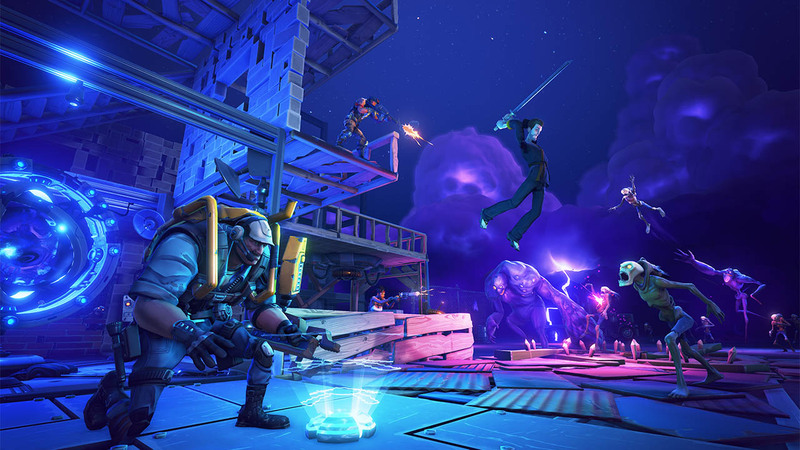 And at some point, we're left with what Fortnite currently is in Early Access: a good game overburdened by everything you have to do to continue playing it. Let's start with crafting. As you play, you'll find either weapons and traps, or schematics for both around the world. Alternatively, you can win them from post-mission treasure chests or random draw llama pinatas. Weapons and traps have different stats and rarities. 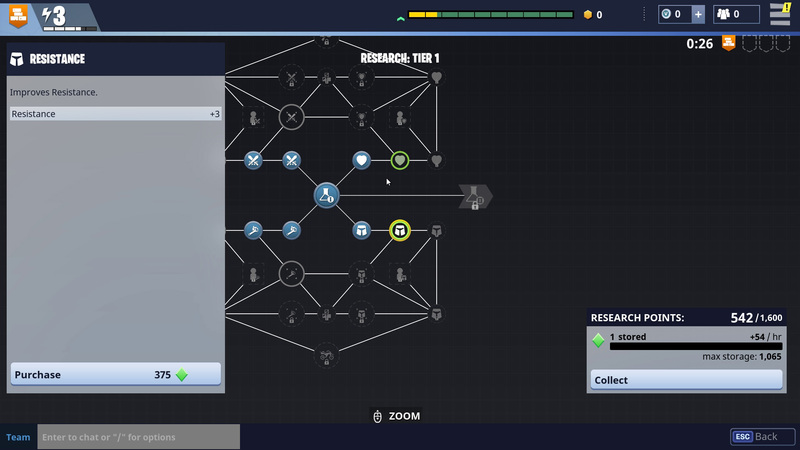 Schematics require certain types of resources found during missions, meaning during the exploration phase of any mission, you'll find yourself beelining for whatever structures will net you those resources. General scarcity of resources outside of the basic wood, stone, and metal can be a problem. Once you have what you need though, you can craft weapons, traps, and ammo at any time. Weapons, traps, and schematics can be upgraded with experience chips. Or you can recycle them for additional resources. Or you can add them to your Collections, a sort of item scrapbook where you can show all the things you've won over the course of the game. Weapons don't last forever either, with durability causing them to eventually break, meaning you need to keep extras or more resources around just in case. Then there are heroes, defenders, and survivors. Heroes are the characters that you play within missions and they're all denoted by cards, also with their own rarities. Heroes fall into a few different classes: Soldier, Constructor, Ninja, and Outlander. Each focuses on a different part of the game, with Soldiers and Ninjas being great at ranged and melee combat, Outlanders being the masters of finding resources, and Constructors focusing on building structures. Heroes can be leveled up on their own, using experience chips to raise their stats and add new skills. It's per hero leveling, not per class; if you spend a bunch of experience on green Soldier card and you get a better blue Soldier, you have to retire the first one, getting most of the experience back to use elsewhere. You want to always be juggling a number of hero cards to be prepared for any situation. Expedition missions give you something to do with extra heroes, sending them on timed missions to complete tasks for loot and experience. There are Defenders, characters that can be assigned to special traps on your persistent base. They'll help you defend your fort, though you have to give them weapons and ammo to do so. (Not really worth it most of the time.) Survivors are the next level down, additional cards for an extra meta game. Survivors have different rarities and level up just like heroes. They come in two flavors: Squad and Leader Survivors. Survivors can be assigned to one of eight unlockable Squads that will boost the general stats of your heroes depending upon which squad they're assigned to. You gain a larger boost if the survivor type of the Lead Survivor - Doctor, Marksman, Engineer, and more - matches the specific squad they're assigned to. Then you get even more bonuses if the additional survivors attached to that squad are matched in personality with the Lead Survivor. Some are Dreamers, Curious, Cooperative, and more. Then there's a skill tree, which is for your entire team, not a specific hero. Leveling up gives you skill points and you can use those to unlock new abilities. Most of the early skill points are actually used to unlock many of the mechanics listed above. There's also a Research Tree. You accrue research points over time up to a set maximum; this is to encourages players to log in on a regular basis. These are then spent on Research bonuses, like stronger offense, defense, and tech power. The Skill and Research Tree each have four different tiers. That's like four different layers of systems to determine character stats. Like I said, complex. 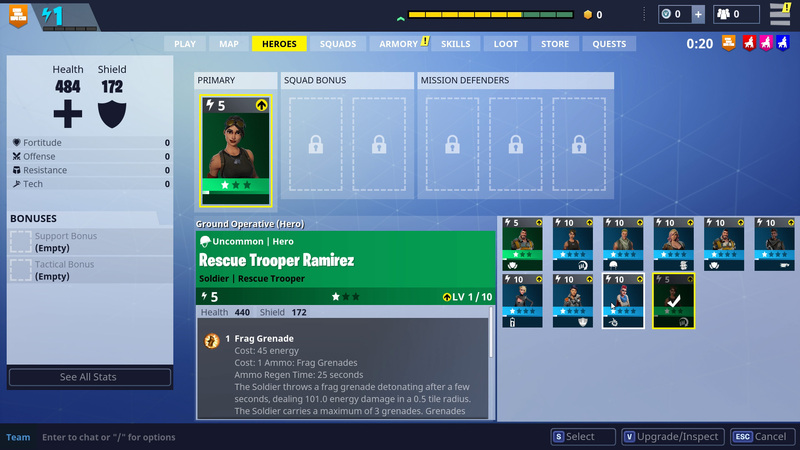 Completing missions gives you llama pinatas, which you break open to get Heroes, Schematics, Survivors, and experience chips. The "free-to-play" comes in because there are various types of llamas, with better llamas giving better and more rare loot. 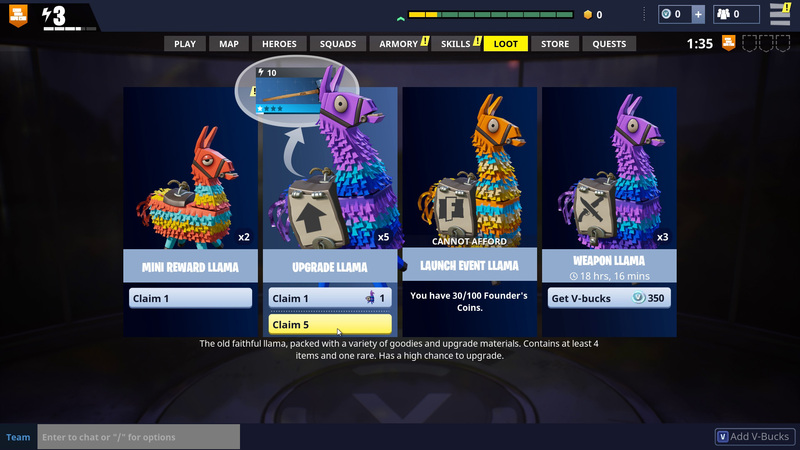 You can buy further llamas with V-Coins, which are an in-game currency you can buy with real money. Basically, everything above is softly pushing you towards this free-to-play model. I never really had an issue with feeling like I needed to spend money, but that's probably because I get a leg up. 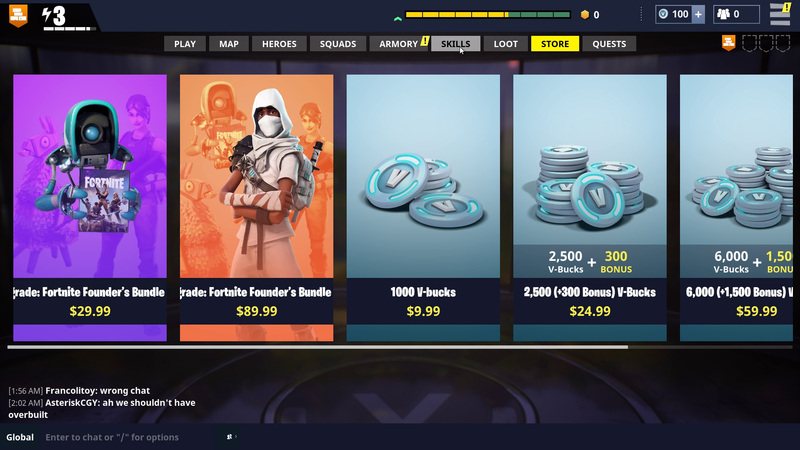 See, while Fortnite will be free-to-play, it's currently in Early Access. There are four different Founders Packs, ranging from $39.99 to $149.99. For review purposes, we were given the Deluxe Edition, which normally costs $59.99. So while it's clear the free-to-play is a focus, we're not quite getting an accurate read of the game starting from a completely free standpoint. Either way, you'll eventually hit the wall in Fortnite. 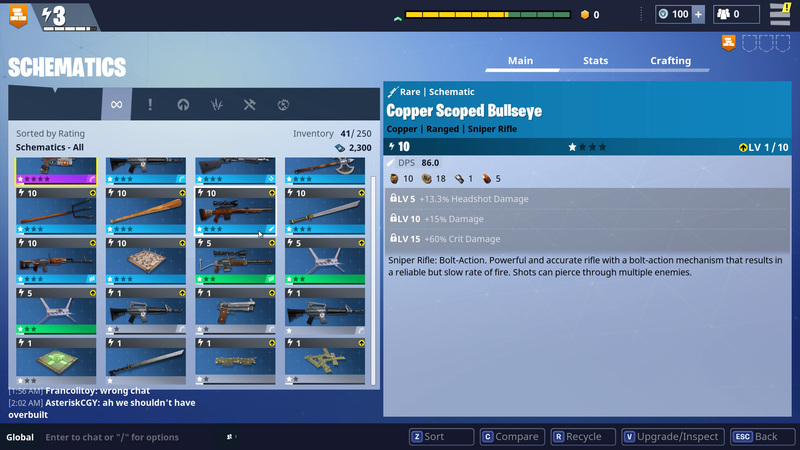 Durability for the better items is tuned poorly right now; the time it takes to get materials versus the time that shiny new weapon lasts is way off. Worse, you get to the point that your progress is gated because of the resources available to you. Many of these resources come from llamas, meaning llamma acquisition is really the wall you're running up against. So Fornite has this really great PVE building horde game that's unfortunately overburdened with the weight of all these systems. And the additional systems aren't really all that fun. You're just collecting resources from play and llamas to level up until you reach a point that you need llamas to get anywhere. And all that up above? That's multiple hours in-game to unlock all those systems. Fortnite is currently in Early Access, so most of this could change in the future. I like the basic gist, but there need to be some cuts and tweaks to prevent the players from having to wade through menus full of stuff that needs to be upgraded, moved, and recycled to proceed. Until then, I'll keep playing, but Fortnite needs some work. Tagged with Action,	Epic Games,	PC,	PlayStation 4,	Reviews,	Steam Early Access.